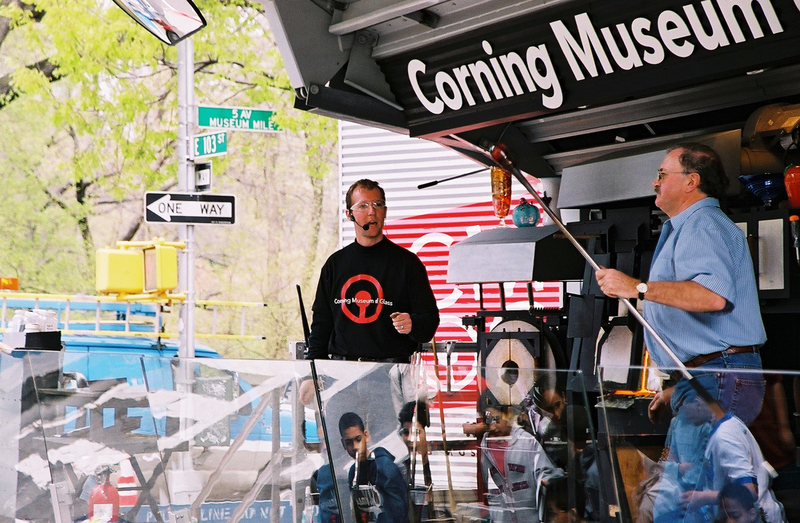 The Corning Museum of Glass Hot Glass Roadshow blew glass just off of Fifth Avenue, to enhance the Museum of the City of New York's 2004 exhibit, Glass and Glamour: Steuben's Modern Moment, 1930-1960, an exhibit celebrating the artistry of Steuben Glass. The avant-garde decades of Steuben Glass coincided with America's own heady days of modernism in the middle years of the twentieth century. Beginning in the 1930s, the company sought to to marry art and industry, function and beauty, glass and glamour, aligning its aesthetic with the progressive art and design sensibilities of the time. This moment also linked design to the era's ultimate modern metropolis, New York City. Steuben's new glass, designed in Manhattan, was fashioned in a range of styles, its repertoire rendered modern by the radical clarity of the company's revolutionary crystal. Steuben's iconic objects from this period unequivocally achieved their early promise to be "as typical of our modern life as the skyscraper or the airplane." The Roadshow provided live, free glassblowing demonstrations for the general public, as well as You Design It; We Make It! sessions for schoolchildren.